Payment Manager gives you a lot of flexibility in what you will and will not allow Accounts to do in the Payment Setup tab of their Account profile. Please take time to make sure you understand the different options so you can make it work exactly how you want. 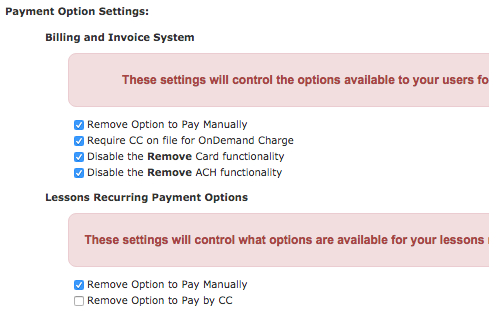 The settings are found in Billing Admin > Billing Setup, under the Payment Option Settings. The screenshot shows commonly used settings by teams. Remove Option to Pay Manually — When checked, an Account will not have the Mail Payments area as an option. The exception is those who have not yet set up an electronic payment method. Require CC on file for OnDemand Charge — When not checked, they will have a Do not allow CC On Demand Payments option in the Mail Payments area, in addition to Use for On Demand Payments for each CC. When checked, only the latter for each CC will show. Disable the Remove Card functionality — When checked, an Account will not have a Remove Card link by each CC. They will need to have a Super User remove CCs for them. Disable the Remove ACH functionality — When checked, an Account will not have a Replace Bank Account link by their ACH account. They will need to have a Super User remove their ACH account for them. Lessons Recurring Payment Options (for those teams with TU Lessons). Note you cannot select both of the below options since there would be no payment methods to choose from! Remove Option to Pay by CC — Check this if you want users to be able to pay swim team fees by CC but NOT Lessons’ fees. When it comes to what payment methods one can choose from when checking out in Registration and Lessons, those are defined in the setup of each.